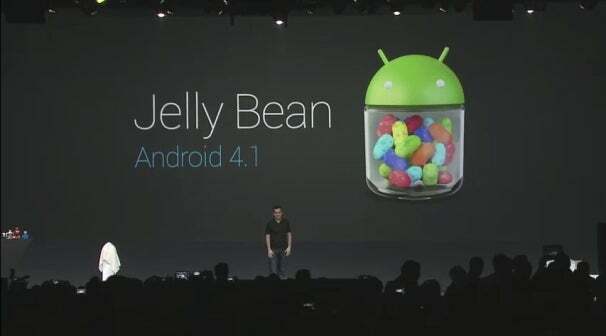 Google today anounced Android 4.1 Jelly Bean, the next update to its mobile operating system. The announcement came during the keynote address at Google I/O 2012 in San Francisco. As its version number suggests, Jelly Bean isn't a major overhaul for Android. Instead, it builds upon Android 4.0 (aka Ice Cream Sandwich), and it's designed in part of make Android faster and more responsive. One key change, known as Project Butter, improves the overall responsiveness of the operating system: Scrolling, swiping, and animations should all look smoother and more fluid in Jelly Bean than they did with Ice Cream Sandwich. The company also worked to improve how quickly Jelly Bean responds to touchscreen input. Jelly Bean will come to the Galaxy Nexus and Galaxy S smartphones and the Xoom tablet in mid-July, but developers can download the app-development tools starting today from Google's Android developers site. Google also made some changes to the homescreen. With Jelly Bean, widgets will automatically resize to fit the available space on a particular screen. And it's now easier to move--or remove--items from individual homescreens, too. In addition, Google improved the keyboard to do a better job at predicting what you're typing, which should help reduce auto-correct errors. Along those same lines, Jelly Bean's Voice Typing dictation feature works even if you aren't connected to the Internet (currently, you have to have an Internet connection to use this feature on Ice Cream Sandwich). But perhaps the biggest addition to Jelly Bean are various improvements to the built-in search function. Search "cards" show search results to various queries in a more visual, easy-to-view way, and they integrate into Android's Voice Search feature. Examples include cards that show the weather forecast, traffic, image search results, and answers to questions like "How much does the Earth weigh?" Google Now, another search-related addition, tries to give you "just the right information at just the right time," as Google's presenter put it. For instance, it'll show traffic conditions during your commute time; if you're at a subway station, it might show you a train schedule. With Jelly Bean, you can use multitouch gestures to expand certain notifications, and actually read emails or text messages without having to open another app. You can also perform certain tasks from notifications as well, further increasing their usefulness. Examples presented in the keynote showed how you can "like" or comment on Foursquare check-ins, "+1" or share photos on Google+, or return missed calls, all from the notification bar. It seems like only a handful of apps will take advantage of these new notification features at first, but Google hopes that more and more developers will incorporate these more advancednotifications into their apps. I doubt that many will, however, since it'll likely be a while until more than a handful of phones and tablets can run Jelly Bean. Very few devices out now come with Ice Cream Sandwich, so don't expect Jelly Bean phones and tablets to show up until at least next year. Other features include improvements to Google Beam (which lets you transfer data from one Android phone to another with just a tap), the camera app, and accessibility features. In all, Android 4.1 is not a dramatic overhaul. Instead, it's a smaller update that builds upon and adds polish to Ice Cream Sandwich. Updated June 27, 2012 at 3:30PM PDT with additional information. Armando Rodroguez contributed to this report.